Francis Alÿs (b. 1959, lives and works in Mexico City) The work of Francis Alÿs is poetic, episodic, and engaged; it addresses the problems of displacement and the absurdity of politics through seemingly futile gestures (a dripping can of paint, an unraveling sweater, a relocated mountain). Trained in Belgium and Italy as an architect, Alÿs settled in Mexico City in 1986 and has since developed an artistic practice that combines actions, photography, film, painting, and collaboration to document and to participate in contemporary urban life and local histories. 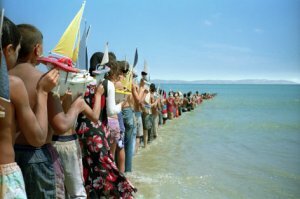 Alÿs’s work has been shown internationally and is the subject of solo exhibitions at the Tate Modern (London), Wiels (Brussels), and MACBA (Barcelona). The exhibition in Marrakech is the first experimental presentation of Alÿs’s project " Don’t cross the bridge before you get to the river" (2009) produced between Tangiers (Africa) and Tarifa (Europe). Francis Alÿs, "No cruzarás el puente antes de llegar al río", 2009. UNA LINEA DE NIÑOS LLEVANDO BARQUITOS SALDRA DE EUROPA HACIA MARRUECOS AL MISMO TIEMPO QUE UNA LINEA DE NIÑOS LLEVANDO BARQUITOS SALDRA DE AFRICA HACIA ESPAÑA. LAS DOS LINEAS SE ENCONTRARAN EN EL HORIZONTE.